This article is about cheap car rental Lisbon Airport and how to find the best car hire company in LIS before booking. We list recommended car hire suppliers below. Find tips and advice about how to secure a cheap hire car deal in Lisbon Airport from one of the best rental car companies. Also please find information about which companies to avoid. VW Polo from Drive On Holidays, Interrent or Payless Car Rental Lisbon Airport. The number of suppliers is very high. In order to obtain the best car hire deal, we advise you to consider companies with offices in the terminal, companies with free shuttle service and meet & greet based companies. Renault Captur crossover/SUV - cheapest SUV rental in Lisbon Airport. Rental VW Golf in Lisbon Airport from e.g. Drive On Holidays or Sadorent. Please note that meet & greet service requires some coordination. In case your flight is late, you may need to reschedule meeting the representative. Also when leaving Lisbon Airport and handing back the keys, you may need additional co-ordination by phone/SMS/chat. Plenty of room for luggage in cheap estate car from U-Drive, Lisbon Airport: Renault Clio Tourer. On the other hand, if using meet & greet, you will not have to spend long time in a queue in front on the rental desk. The swiftness all depends on how well coordination between customer and rental company representative takes place. In high season, meet & greet is the quickest way of getting the keys to your car. Less so maybe when handing back the car keys. You do need to calculate a bit of extra time. Previously, in Lisbon Airport, Interrent was operating free shuttle service. Interrent switched to meet & greet. It did not get better - in fact Interrent has not gotten the best reviews lately. Green Motion - soon to be in Lisbon. Low basic rates, lots of additional fee's, almost like Goldcar - in some locations you pay for car wash!! Warning: Green Motion has so-so reputation in the UK - let's see. Multiauto does not exist anymore. Instead, you can book with U-Drive. JAP Rent A Car is also defunct. The Lisbon Sixt franchise is run by the same (JAP) owners. The well-known, countrywide in Portugal, rental company Auto Jardim does not exist anymore. Cheap rental car in prestige class - why not book Mercedes A-Class from Rent-A-Star? A new trend in Portugal is the availability of prestige vehicles for rental purposes at very low rates. The company Rent-A-Star supplies exclusively Smart and Mercedes cars. If you book a Mercedes A-Class or a Mercedes CLA, sometimes, you do not need to fork out more than about £70 / €80 for one weeks rental. In winter maybe even less. Rent-A-Star in Lisbon Airport is a solid company with a good reputation. Just avoid booking the Smart cars (cheapest car size) unless you really like them. Smart cars are really not very luxurious anyway and rather noisy. Also recommended is taking advantage of competitors like Drive On Holidays and Alamo that may offer similar entry luxury vehicles like BMW 1-series and Audi A3 at low rates. Prices for cheap car rental Lisbon Airport fluctuate wildly over the year. In low season, some of the cheapest car hire rates in Europe can be found in the Portuguese capital, but come holiday season, prices go up - and up. The highest prices are seen end July and August. We recommend not to wait until last minute with booking a car in Lisbon Airport in the busiest part of the summer holiday season. In high season, with many tourists, prices for hire cars can go through the roof, even for the smallest of vehicles. It does not happen every year, but when it happens, even the cheapest car can cost the same or more than the normal rate for a large luxury vehicle. Important advice: Book your rental car well in advance for holiday season. Popular rental vehicle with lots of luggage space - Fiat 500L from e.g. Centauro. Spacious, but compact rental cars like the Citroen Berlingo, Peugeot Partner and Fiat 500L come in a 5-seat configuration. The advantage of these vehicles is the large amount of space for luggage or even larger items. If you fold the seats down, those vehicles will easily swallow a bike or three. Look for this type of vehicle under 'compact' in the same class as VW Golf, Renault Megane, Ford Focus, Fiat Tipo, Peugeot 308, Opel Astra, Kia Cee'd, Citroen C4 Cactus, Hyundai i30 and similar. For proper SUV cars for rent in Lisbon Airport, we recommend the Nissan Qashqai, Suzuki S-Cross, Hyundai Tucson or Kia Sportage. All are SUV's with slightly higher ride height than normal passenger cars. In recent years, cheap SUV rental cars have become available; bar the very high season where, mostly they become more or very expensive. If booking your cheap SUV in Lisbon Airport well in advance for your summer holidays, you may be able to find one for less than €150 / £130 per week. Best SUV in Lisbon Airport - compact (but still big) Nissan Qashqai from e.g. Alamo. Book your Nissan Qashqai SUV with companies like Drive On Holidays, Europcar or Alamo. If you need a rental car with 7 seats, 8 seats or 9 seats, the cheapest option is often to rent a minibus. MPV cars (Multi-Purpose-Vehicle) can be found for hire, but most of them will have a 5+2 configuration which leaves virtually no luggage space when using all 7 seats. The 5+2 MPV cars include VW Touran, Renault Gran Scenic and Citroen C4 Picasso. Minibus rental in LIS with 8 or 9 seats will often turn out to be cheaper than renting a full size 7-seater MPV - unless you can find a good offer for a full-size MPV with 7 seats (like ford Galaxy/VW Sharan) and room for luggage with use of all seats. When booking a minibus, you can see in advance on the offer if the people carrier has 8 or 9 seats. All 8-seater and 9-seater minibuses for hire in Lisbon Airport can be driven with a normal, valid drivers license category B for passenger cars. Mercedes Minibus rental in Lisbon Airport can be very cheap if booking outside high season. We have noticed that Drive On Holidays, frequently, will offer very low rates on minibus hire - and they have Mercedes Vito / V-Class cars in the fleet. How do you, as a customer, avoid being cheated by car rental companies? It is quite simple. Nobody can avoid car hire scams and unscrupulous car rental companies 100%. However, if you follow the below guidelines, you are likely to avoid losing any money. In short, you can relatively easily take care that you are simply too difficult and time consuming to be the victim of a scam by a car rental company. The camera in your phone is your weapon of choice. Low rental rates in Lisbon Airport are super advantageous for the customers, but do not forget that rental companies suffer economically when having to rent out cars for less than £50 / €55 per week - especially if the alternative is not to rent any cars at all. Staff, office/parking cost, car insurance & road tax still have to be paid. You should expect some companies to be in financial trouble and some of them to simply apply the strategy to offer lowest basic rate after which they charge you for whatever they can get away with according to the rental contract. This is pretty much how Goldcar & Rhodium operate. Their strategy seems to be to rip customers off. In Lisbon Airport, you will find very cheap rates most of the year. Fortunately, most car rentals take place without problems. It can happen, that an economically unstable company tries to improve performance by speculative actions, preying on the naivety of some customers. This is also the typical modus operandi for Goldcar and Rhodium - in fact we think it is their main strategy: Rock-bottom low prices to get the customers to book - after which all sorts of fee's and tactics to make the customer pay more are applied. Please find below simple steps how to avoid any car rental scam. Sixt office in Lisbon Airport - a respectable car hire company. B) Book well in advance - you can always cancel 24/48 hours before pickup anyway without any cost. Secure your cheap rental car booking as soon as your flight ticket has been confirmed. This is particularly important when booking MPV and minibus rental for 7,8 or 9 people. Please note that airlines earn money on car rental - check for cheaper rates elsewhere. C) At pickup (in rental terms the checkout), check your car thoroughly for scratches and dents. It is very common that customers are made to pay for minor damages that did not occur during the actual rental. All damages are expensive - even in Portugal. Also check the interior for damages to the seat covers and panels. Cigarette burn marks are a classic. You have to carry out the check in daylight or with a torch. Do not rush this check. Cars in Southern Europe can be quite dented and scratched. It is normal even for almost new cars, but it is not recommended to neglect checking the car. Not checking your rental car thoroughly at checkout can turn out to be extremely expensive. Remember that your rental is pure business for the car hire company. If your rate is very low, the company would not be in business unless it made additional revenue - from customers like you. The lower the rental rate, the more you need to use the camera in your mobile phone to document scratches and dents as well as anything unusual in the interior of the car. D) Always bring a 'real' credit card. Prepaid cards or debit cards might be accepted, but do not rely on this. Bring a credit card in the name of the driver like VISA, Mastercard or AMEX. If you do not have a proper credit card with sufficient funds to cover the excess, you are likely to be forced to buy additional excess insurance or lose your booking AND booking deposit. Excess insurance bought at the counter can be extremely expensive - and the rental company will not care at all if you already took out excess insurance when booking online (at a much cheaper daily rate). If you cannot present a credit card with sufficient funds in the name of the driver, you are likely to be charged a considerable amount extra; sometimes 2-5 times the basic cost of the rental. If in doubt about your credit card, ask your bank in advance before travelling. E) Check fuel policy before booking. You will, sometimes, see odd fuel policies like "return with as much fuel as when picked up", "return with 1/4 tank" of "return with no fuel/no refund of fuel" or similar. Any unusual fuel policy other than full/full (meaning tank is full + customer fills up with full before handing back the car) is made to the advantage of the car rental company in order to extract extra money out of the customer. Full/full is the best policy for the customer as there is to catch. All other fuel policies are, in fact, a trap for the more naive and/or forgetful customers. A lot of customers simply fill up the car before returning it without considering costs and fuel policy applied. For any additional litre returned (compared to agreed in the contract), the car hire company will earn €1 or more. If you spot a very cheap offer for car hire with a 'funny' or unusual fuel policy, add at least €10-€20 to the rate as you will for sure be cheated somewhat on this deal. F) Avoid the companies with the worst reviews or if they are not recommended. Those companies are most likely to cheat customer. A saving of €20 or €50 on the basic rental rate can quickly turn into an extra bill for €100 to €300 + lots of hassle not needed on your holiday. If we do not recommend a cheap car hire company in Lisbon Airport, it is for a reason. The moment of truth in LIS car rental return area. All cars from car hire offices based in the terminal go through here, and the polite guys working in car rental return are not giving anything away. You will find that the companies have much more attention to detail when taking back the car (check-in) at car rental return in LIS compared to when the customer picks up the car (check-out). At check-out, only the signature of the customer on the damage sheet of the car is important. Should you run into trouble with a car hire provider in Lisbon Airport, you have an advantage with a booking from us. We will support you and assist you complaining over any extra charge from the car renter that the contract does not support. This we will, naturally, do free of charge. Goldcar and sister company Rhodium do not have the best reputation. Numerous customers have reported problems with scams and overcharging. Most common is the forced sale of expensive excess insurance at the counter. Goldcar problems seem to be worse on Spanish destinations like Mallorca, Alicante and Malaga Airports. We would, however, not take the chance on Goldcar in Lisbon Airport either. Goldcar and Rhodium may sometimes have the cheapest deal, and we do admit that some customers are perfectly happy with the service. However, from our experience, a large number of customers end up feeling cheated by Goldcar. Therefore, in our opinion, it is not worth the risk to book a car with either Goldcar or Rhodium. Please see more about problems with Goldcar & Rhodium. Due to its central location, Lisbon Airport is a perfect base for discovering the Lisbon Coast, allowing easy access to both northern and southern Portugal. With the well-developed motorway network in and around the Portuguese capital, it only takes some 2.5-3 hours to drive from Lisbon Airport to either Porto in the North or to sunny Algarve in the South. The Lisbon Coast - full of attractions. To the west of Lisbon (some 35 km), you find the lovely beaches of Cascais and Estoril. Close to Cascais and easy to reach by the IC19 highway directly from the airport, the picturesque village of Sintra offers all its charms only half an hours drive away. Map of Lisbon and the Lisbon Coast. Lisbon Airport is located approx. 5 miles north of Lisbon historic quarters and only some 3 miles from the proper city centre. A variety of public transportation solutions, including metro, buses, airport shuttles and taxis, connect the airport to the city centre and car rental is not necessary if Lisbon is your main destination. See more about public transport in Lisbon including metro from the airport. Private transfers can be ordered to any location in Portugal from Lisbon Airport. The driver will meet you in the airport at your arrival. We tested the service and it works well. Please see options for private transfers for any number of passengers (also minibus-service). Private transfers available from Lisbon Airport - at cheap rates. If you consider say a transfer from Lisbon Airport to Cascais, it will usually be cheaper than normal taxi rate to Cascais from the airport. In general, the longer the travel distance in a car, the more you save with private transfer (compared to taxi) in Portugal. Do consider, however, the car hire option to explore the wealth of tourist attractions and places of interest in a short drive distance from the city, amongst the Queluz, Cascais, Estori, Sintra, Setubal, Costa da Caparica, Leiria, Obidos, Mafra and many, many more (please find the list of approximate road distances further below). Lisbon Airport is by far the largest Airport in Portugal. It is also known as Humberto Delgado Airport or amongst the Lisboetas as Portela Airport after the area of the capital, in which the airport is located. The official name in Portuguese is Aeroporto de Lisboa and the flag carrier TAP operates the largest number of flights in and out of LIS. For many tourists arriving to Portugal, a hire car picked up directly at the airport is the most convenient way of travelling during their holiday. The Portugues expression for car hire is aluguer de carros ou aluguer de viaturas. Lisbon Airport, which now serves over 25 million passengers per year, is managed by ANA Aeroportos de Portugal, the national airport authority responsible also for Porto Airport, Faro Airport and Beja Airport in mainland Portugal, as well as for the main civilian airports of the Azores. 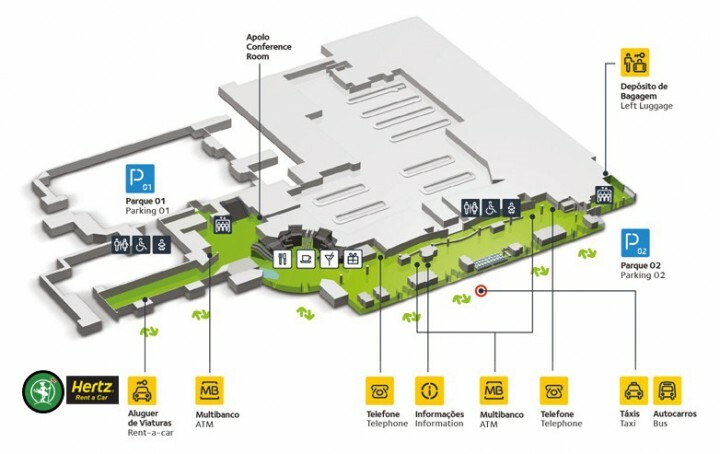 Lisbon Airport facilities consist of two terminals. T1 is the main terminal of Lisbon Airport, handling the majority of international traffic. The arrivals hall is located in the lower level. Terminal 2, located nearly a mile away from the T1, is a departure only terminal, handling domestic operations and flights from some of the low-cost airlines. If you are flying low-cost out of Lisbon, your flight is likely to take off from Terminal 2. When arriving to Lisbon, you will always disembark in T1. Terminal 2 of Lisbon Airport does not have parking facilities. Terminal 1 and Terminal 2 are connected by the airport curbside shuttle service, with stops right in front of each of the terminals. The shuttle runs every 10 to 20 minutes and the ride takes approximately 3 minutes. Please not that it is not possible to walk between the terminals as a large part of the route is unsuitable for pedestrians. Find more information about Lisbon weather throughout the year. Best car rental Lisbon Airport. How to book the cheap hire car Lisbon Airport, Portugal? Recommended car hire companies: Europcar, Avis Rent A Car, Budget, Hertz, Centauro, Enterprise/Guerin, Drive on Holidays, Sadorent, U-Drive, Rent-A-Star. Transport options to and from Lisbon Airport.